Vincent Ramsay, 55, was struck by the heavy vehicle while working on a site in Edinburgh. 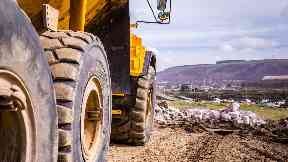 A construction company has been fined £600,000 over the death of a workman who was struck by a dump truck. Vincent Ramsay, 55, was killed at a former tram depot in Leith, Edinburgh, after being hit by the truck at the bottom of a dirt ramp leading into an underground car park. The dad-of-four had been crouching down to carry out a respraying task at the time on December 5, 2016. London-based Allenbuild Ltd admitted health and safety failings at Edinburgh Sheriff Court and on Friday was handed the fine. Sheriff Norman McFadyen said the truck, which was carrying excavated earth, had stopped to allow other vehicles to manoeuvre. But due to restricted visibility caused by the skip and its load, the driver then ran over Mr Ramsay when he moved off. Sheriff McFadyen said the company should have recognised there were instances where site personnel had to access the underground car park on or near routes used by vehicles. He said the firm should have ensured work in that area was better scheduled. He accepted that the company had been in business for more then 70 years, had no previous convictions and had pleaded guilty at the earliest opportunity. Sheriff McFadyen explained that the purpose of the fine was to bring home to both management and shareholders the need to comply with health and safety legislation. He said: "It is not to put a value on a human life and that is not what the court is doing. It is punishing the company." He concluded by expressing his own condolences and sympathy to Mr Ramsay's family.